Well, the Christmas season is here and life is getting a little busier than normal. We have many things going on at the church of course. Allie is in a musical and has been practicing for that since September. She is doing great with her school work. Her days are full of learning, reading, socializing, and creating. 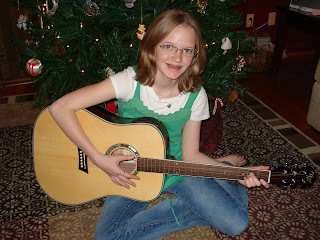 She continues to play piano and is taking guitar lessons also. She loves that. Music is a passion for her right now. 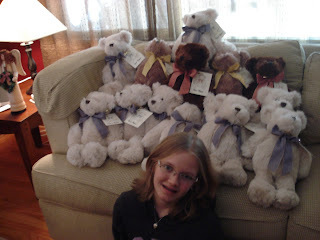 She has been collecting teddy bears for the children's hospital here. We are calling them Tear Bears and they are given to the brothers and sisters of the children who have passed away at the hospital. It is a way for her to honor her sister's memory. We are very proud of her compassionate heart. I'm sorry if this sounds like a Christmas letter but since I don't write them, I guess it is. I guess I am feeling reflective. 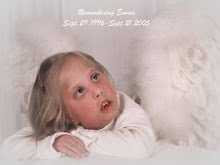 Last night we attended a remembrance service at the hospital where Emma died. It is a sad service but a necessary one. 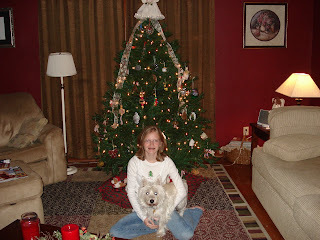 It makes me think of how much we are missing with Emma not here for Christmas but it reminds me of what she has gained. Experiencing life with our Savior in Heaven is beyond my comprehension. It is Christmas everyday and much more. Being at the service also made me so thankful for Allie and the comfort she brings us. I am amazed by her. Some people comment on how much she has been through and I know they feel pity for her. I admit, her life has been different. There has been a lot of pain but there has been so much joy. She is who she is because of all of that pain and all of that joy and I am so very, very proud of her. I can't wait to see the amazing things she does with all of these life experiences. 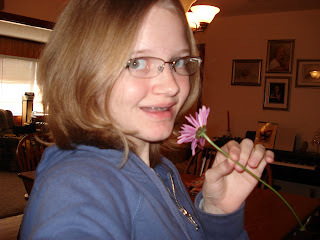 I think the world will be changed by a girl like Allie Olson! My excitement grows as the story of your upcoming little one unfolds. You certainly do have much to be proud of in Allie - a lovely young lady who you can tell really loves the Lord. Thanks for allowing me once again to share in the service at the Hospital. It may sound strange but it really helps me to refocus each year on all the things that are so important in life and are too often taken for granted. Can't wait to see another stocking hung by the fire (well in Florida - by the A/C thermostat) next year. Love You Guys!